DE Running Mom: Designer Whey and SMARI Icelandic Yogurt! Designer Whey and SMARI Icelandic Yogurt! 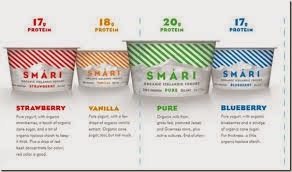 If you have not tried Smari Organic Icelandic Yogurt you are truly missing out big time!!! We love yogurt in our household and Smari is now my favorite. I really hope more stores close to my house start to carry Smari asap! Mix well then press firmly in a 9 x 9 pan and place in refrigerator for a few hours. The boys taste tested before I could snap a picture! I am loving the versatility of mixing Designer Whey into every day foods especially homemade pancakes and waffles! I get so bored with plain Vanilla and Chocolate flavors so these two flavors were a nice change! Especially the Vanilla Almond! I love the convenience of these products! I LOVE how convenient and tasty these products are ... the Protein 2GO I seriously just carry with me in my purse or gym bag and add water for a super fast recovery drink post run/workout! Does it get any easier?? So if you are looking for a protein mix or products I recommend trying any of the above!! Check out FitFluential and Designerwhey for more details. This post is sponsored by FitFluential LLC on behalf of Designer Whey. All opinions are my own. is designer whey available on Australia?